The Homeschool Science Fair was last night. It is always such a fun time. Don't these scientist look like they're having a blast? Look how far they've come! Malcolm had to be encouraged to stand next to his little buddy. There are four of us starting up this academy. It is designed to assist homeschooling families with two-day a week instruction, and the students learn at home the other three day. Very much like Victory Academy where I taught while living in Atlanta, but with a Classical focus. Really, LMCA is all that I have been working on for the last month, even with the science fair fast approaching. It is a lot more work than I would have thought. We have completed the paperwork for our non-profit status and have finalized about half the curriculum and found most of the teachers. So far no one is working for pay the first year. 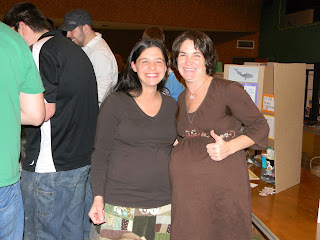 Not to jump around too much, but Malcolm had a great time at the science fair. He climbed on tables and podiums. He rode plasma cars around. 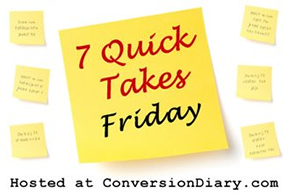 Check out more Quick Takes at Conversion Diary. LMCA sounds awesome! And your scientists are too cute. Wonder Girl Battles Thumb Sucking!